Posted: Wed May 21, 2008 7:12 pm Post subject: ARCHIVE: Where We Sailed Today, Thread Part I. Someone suggested starting an ongoing thread where people could compare notes about where to sail each day, and also on the flipside: where did you sail and how was it? Well OK, here it is for the West Coast forum. 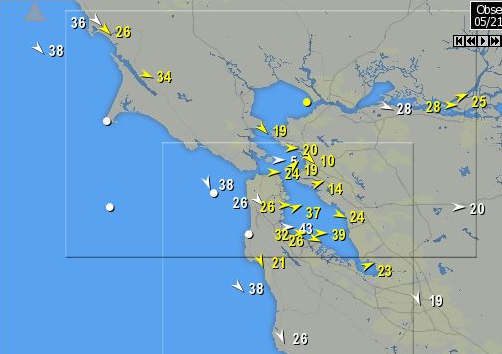 Attached: iWindsurf SF Bay and So Cal wind maps from 5 PM Wed May 21. Pure stoke. Anybody get some of this and live to tell? 39mph on an ebb in the channel!? I don't have gear small enough . . .
Sailed Crissy yesterday from 4:30-7pm on 4.2m/75L, there were fun, fairly smooth mast-high swells rolling in in btwn the GGB towers and the central bay just off the launch had some unusually fun swellage as well. Couldn't get out today, but hope it holds some for tomorrow . . . Anybody tackle the coast -- it looks pretty ferocious? Went by Palo Alto around 3, bunch of people out there. Didn't have small enough stuff to sail and couldn't sack up enough to get out there on the 4.7 after seeing one guy totally wound on a 3.7. Foiled again. Sailed Embassy, only one out. Went out at 5.30 pm. 6'3 207 lbs. 84 liter board. 4.0, powered a touch over in the gust, a fun few ramps outside the runway. Couldn't see anyone at Coyote either, where was everyone? Don't feel alone, I sailed by myself at Haskills in SB on 4.2 and a 65 liter board. One of my best days this year. Sometimes the planets align and you get it all. Kind of mystery stuff that nobody else sees. Sailed third avenue yesterday on the inside only. Well over-powered on the gusts on a flattened out 4.0m and a 65 litre board at 175lbs. Ramps every where. Got some sweet jumps. Then my boom snapped. Saw big men on 3.3m sails being blown around. sailed Crissy today, first time this year, and on a new board; 101 starboard carve, 5.0, 197lbs, yikes i got plump this winter. it was packed with sailors but super fun. compared to yesterday it was def a lighter day and a bit holey. not much swell but lots of crazy chop. being from berkeley i think i'll start making the drive to crissy for guaranteed sessions. it blows till sunset. the place is magic. Sailed Tomolas grassy point going off! 3.7 8' 4" Haut Glass custom 165lb over powered but hung in there for about 3 1/2 hours . One guy came out for about three runs to over powered on his old 4.0 sail. Another guy came out and sailed for about an hour and a half. What a day ,big rolling swell and big ramps for jumping if you were brave enough? @:30 pm to 6: 15 only the three of us. Sailed the Stick. There were 6 or so of us out there. I was on the biggest sail there, a 5.0 Ka Koncept, with my starboard slalom 90 L board. I set new PR's for 250m and 500m speed runs with my GPS, and came within 0.15knots of my previous "ranking" speed on gps-speedsurfing.com. It was a super blast, although very tiring! The chop was big for candlestick i thought today. It was kind of tough finding smooth water to let it go real fast. 3 of my 5 fastest runs were on port around 95 deg off the wind, I couldn't go deeper because of the chop patterns. On the starboard runs I could go deeper, but I had several scary moments as I was on the verge of a yard sale a few times but kept it together.